Membership is the key to any Y experience. When we ask you to join the Y, we are hoping that you do so for more than just a place to workout or take your child for childcare. We hope that you will become engaged with other people who are just like you. You might meet a group of moms who are trying to get out of the house on a cold winter day. You might find a group of marathon runners who have blazed the path before you and are willing to give you some tips completing your first marathon. You will also find people who are not like you, different cultures and races, who can help you have a better understanding of the community we live in. There is so much more to a Y membership. We are the community melting pot! Join today. Membership is more than a card or being able to access our facility, it is the community that is built by being involved with something larger than yourself. We are here to help you set and reach your goals. We will teach you things about yourself that you never thought were possible. You receive program registration priority with many of our classes included as part of the members or around $17. You will receive access to our facility. Reduced fees for childcare and summer camp. Access to other Ys around the country through our AWAY program. Click here to see where other Ys are located that you might be visiting. Please remember that certain rules and restrictions apply. Membership is the key to opening many doors in the Y. We pride ourselves on giving you a quality experience every day that you come to visit us. Not only do you have access to a great facility on the lakeshore, you also are building your community as the Y takes our mission outside our walls to your neighbors. We hope, no matter how the day has gone for you, that you leave with a smile on your face! Access to 135,000 square foot facility with pools, gyms, lifestyle center, and saunas. We also have special guest privileges for our members. First opportunity to register for our life changing programs, many of which are included with the membership. Click here for more information about our programs. Your Y membership will also give you access to many Ys around Wisconsin and the United States as an A.W.A.Y member. Click here for more info. Unlike any other organization, we want to make sure that everyone can enjoy the Y - no one will be denied the benefits of a Y Membership due to their financial status. Funds are genoursly donated by our local community to support those in need of assistance. Need some help? 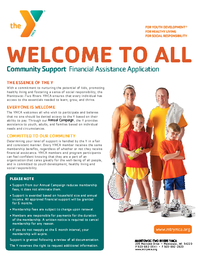 The applications process requires completion of Membership Assistance form and proof of income. In order to receive the financial assistance rate adjustment, you must present a current tax return to verify household income at the time you join. Accepted documents for income verification include the 1040, 1040EZ or 1040A. A staff member will view line 22 of your 1040, line 4 of your 1040EZ or line 15 of your 1040A. If you are not required to file taxes, please present a statement of non-filling, which can be obtained for free by calling 1-800-829-1040. You may also request verification of non-filing statements by visiting http://www.irs.gov and clicking on "Order a Tax Return or Account Transcript." Membership Assistance is available on a sliding fee basis. Contact the Y for additional questions. The YMCA Coporate Wellness Program is an investement in the well-being of your employees and your business. The benefits of regular exercise cannot be disputed. Exercise helps people be more productive, manage stress better and stay healthy, developing a more positive outlook at work and at home. The YMCA Coporate Wellness Program is a great way for companies to promte these benefits in their employees, and their families. Once a company becomes a Corporate Wellness Partner, their employees will be eligible for a one week trial membership. Upon joining the Y, they will enjoy the benefits membership offers, including free health and wellness orientation, discounted program fees and priority registration, free group exercise classes, volunteer opportunities, and so much more. Invest in your employee's health and well-being by becoming a partner in the YMCA Corporate Wellness Program. Business partner provides their employees a monthly membership subsidy at a minimum of $5 per month. The Y matches 50% of business partner's employee monthly membership subsidy up to $10 per month. The Y provides participating employees a complimentary one week trial membership. The Y will provide employees one annual complimentary service such as a "lunch & learn" at the employer worksite on a health/well-being topic of interest. The Y will have representation at your company Health Fair. The Y will provide, upon request, monthly tracking of employee usage. Our new system is not currently able to auto-apply corporate incentives or financial assistance to program fees or memberships when recipients register online. Those eligible for Corporate Incentives will need to join in-person. Those eligible for program scholarships and financial assistance will need to register in-person in order to receive the adjusted rate at the time of payment. We apologize for this inconvenience. I certify that all information I provide on the online membership application is true. I also understand that incomplete information or false statements may disqualify me. I agree that all forms of physical activity involve a risk of injury. By voluntary participation in YMCA programs and activities, I assume and accept any and all risks of injury related to that activity. I also agree to follow the rules and policies of the Manitowoc-Two Rivers YMCA including the Code of Conduct and Photos/Talent Release listed below. Memberships are non-refundable and non-transferable to another person. By clicking and continuing with online membership application, I agree to abide by these terms and conditions. Every person who steps through the doors of the Manitowoc-Two Rivers YMCA is asked to uphold the YMCA Membership Code of Conduct. Any individual that cannot follow these standards will be denied a membership. I agree to these behavioral expectations. I hereby irrevocably release, consent and allow the Manitowoc-Two Rivers YMCA and its agents to use my or my family members’ photograph/likeness/voice, as it pertains to my participation with the YMCA, in any manner, for promotional efforts without expectation of any reimbursement in connection with its use. Memberships prorate when you join to charge only for the rest of the current month and then continue to draft from a bank account on the 1st of each month thereafter. All memberships now end on the last day of the month if you cancel. You must give a notice to cancel by the 25th of a month to avoid another draft. Any NSF will incur a $25 fee. By submitting your information online for a membership, you are agreeing to the terms stated above. Scroll down to continue your membership online. 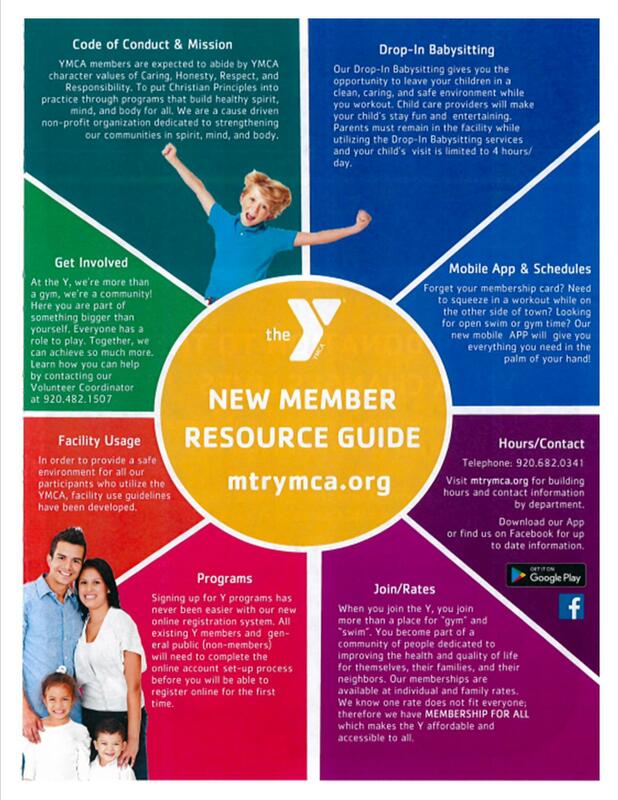 For more information regarding Membership at the Y, please contact Krystel, Senior Member Engagement Manager, at 920.482.1523 or via email kotto@mtrymca.org today!